This morning was the time we've been waiting for for quite a while. At 8:00 sharp John Wishlow pulled into the yard with his big crane truck and it didn't take long to scope things out and set up the truck. 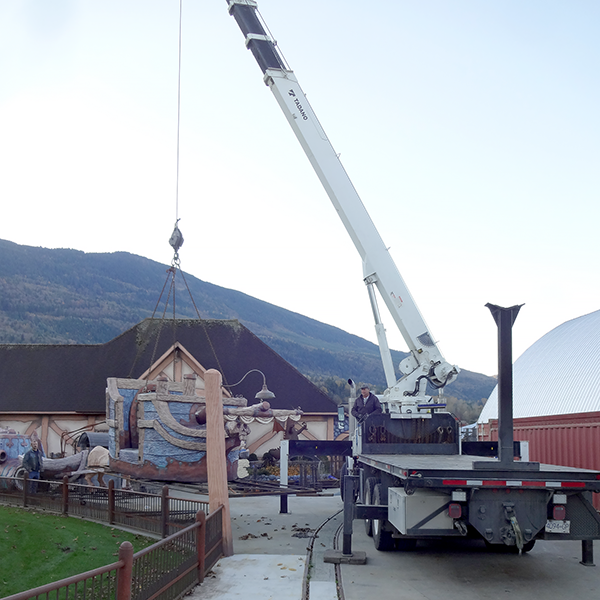 The plan was to hook up the ship, lift it to the truck deck and then move the truck closer to the shipping container. John is a wonderful crane man, one of the smoothest on the controls that we have ever worked with. As the ship cleared the ground John called out the weight... 8,000 lbs. This is about what we figured. We would then do a second lift into the giant metal bin. Peter and I would guide it in. Each piece had been carefully measured and planned to go into a standard shipping container with an inch of clearance on each side. But this was not a standard container as it was an open top. It turns out they have a beam running down each side to provide stability. This made the container one inch too narrow to lower the ship down through the top. But there is always a solution if we think things through... After considering a bunch of options we decided to move the ship to the center of the container (lengthwise) where there was the most flexibility and then rest the ship frame on one side while lowering the other. Once the ship was under the beam on one side we would use crowbars to slide it over and then the second side would pop nto the container too. It was a tricky operation and it was defnitely scary but it worked perfectly and the ship went in without a scratch. The next challenge will of course be to remove the ship from the container in Trinidad. This will be much easier as we can unbolt the shipping cradle before we lift the ship with the crane and it should come out cleanly. It will then be placed down on it's permanent foundation in the center of the pool. While the crane was onsite we also moved the archway we had built for Peter and Hailey's wedding. It was lifted onto the deck of the truck, tied into place and then transported down the street to their house. The challenge here (and there are ALWAYS challenges) was to get the arch under the telephone wires and through the hedge before moving it into place. We inspected the hedge carefully and found two trees that were a little wider spaced than the rest. The arch would squeeze through without difficulty. Once the hard part was done it was a simple matter of dropping it onto the foundation that was already in place. I love it when a plan comes together - even if we have to figure it out as we go.